In October my mother and I were in County Kerry driving in our rental car across the Dingle Peninsula following the signs to Brandon’s Creek. We drove down narrow, walled country lanes to a wide spot in the road where we parked and got out. Across from us was a field of sheep, with Mount Brandon rising into the clouds behind. In front of us was the Atlantic Ocean through a rocky break in the land. 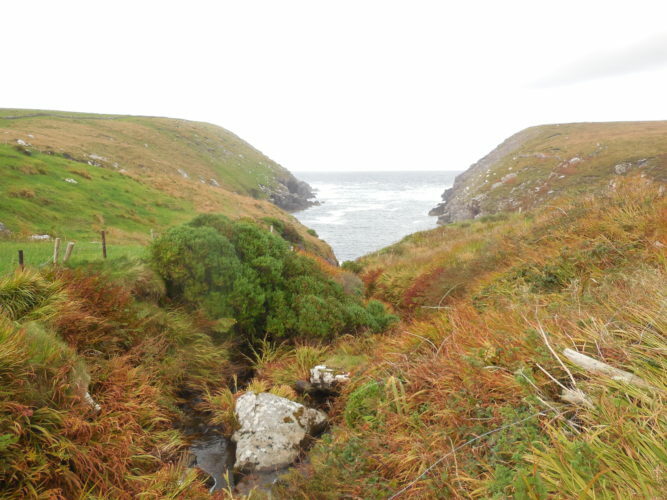 We had arrived at the spot where Brandon’s Creek flowed through pastures and into a small bay before the crashing of the Atlantic waves. Goats were grazing on the steep cliffs above the bay. We sat on a stacked stone wall and listened to the surf and the wind. At that spot, in the sixth century, St. Brendan the Navigator set sail on his seven year voyage that, according to legend, may have taken him to North America and back. During the rest of my trip to Ireland I kept reflecting on our visit to Brandon’s Creek and the story of the medieval saint. There on the edge of the land with the vast ocean spread before him, Brendan and his companions, driven by a call to mission, risked everything. Our ancestors did as well. Those religious dissenters from England who survived the first winter in Plymouth. The refugees from religious wars in Germany who built farms and hospitals on the prairies. The pioneers who settled this territory. God calls us to be light to the world, to share the good news. We did that in 2016. Our work with the refugee family is the example we keep talking about. How will we fulfill our mission in 2017 or 2027, which we dreamed about yesterday? I believe that we are entering into a time period when the message of our church is vital. Our theological tradition understood that we are fallible creatures who also participate in the glory of God. We cultivated the moral virtues and valued intellectual integrity. We pursued truth with humility and candor. Critical thinking, suspicion of authority, open-mindedness, and entertaining doubts, these are among our essential qualities. We understand them to be spiritual practices, part of our devotion to God. These spiritual practices ultimately led to us become defenders of liberty, democracy, and human rights. We became more inclusive and welcoming, building bridges with people of other races, cultures, and faiths, and advocating for a more justice society. We have been on this continent for 397 years. And through that long history our mission, our calling from God, has been to build a society that will be a shining city on a hill, as John Winthrop, one of our Founding Fathers proclaimed. To our own personal spiritual growth, which includes intellectual and moral development. To the education and formation of our children to be followers of Jesus. To our service and citizenship within the wider society. God has entrusted us with a grand mission that requires our courage and faithfulness. I believe we are up to it, just as our ancestors were. Onward and Upward!